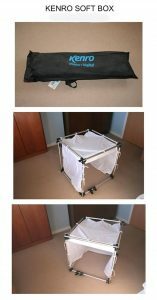 The Kenro Soft Box is suitable for table-top work. Put the item to be photographed in the box and shine lights from outside. The fabric softens the light so that there are no harsh shadows. Next PostNext Studio – Portaflash lights in holdall.